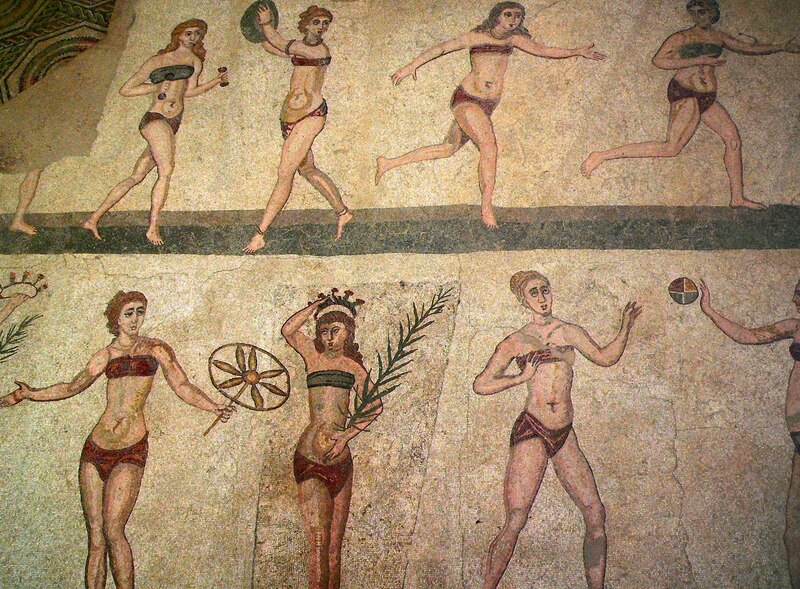 The Ancient Romans wore very simple clothes similar to those worn by the Greeks, but developed into styles of their own. 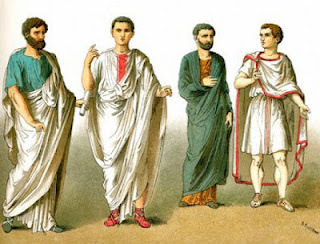 We’re all familiar with their tunics and togas, which we’ve seen in lots of movies and TV shows set in Ancient Rome and pictures painted at the time that have withstood the centuries, but that’s not all the Romans wore. All their clothes though were very simple and draped around the body or fastened with clasps and brooches. That’s because needles at the time were coarse and unwieldy, and so sewing was something done only when strictly necessary. The tunic was the most basic item of clothing in Ancient Rome. Everyone, whether men or female, rich or poor, slave or free man, wore one, and it also doubled up as a pyjamas. Tunics looked like modern t-shirts, only longer (men’s reached the knees, women’s the ankles), and were very comfortable. They were made of cool linen, usually imported from Egypt, for the hot summer months, and of warm wool for winter. When the weather was really cold, people could wear up to 2 or 3 tunics to keep warm. The wool wasn’t dyed and was usually of a beige colour, which easily disguised dust and small stains. Tunics could be worn plain or belted, and while they were the only garment worn by the poorer classes, the wealthy wore a toga over it. Only male Roman citizens were allowed to wear a toga, which was usually made of wool. Although at first they were quite small, overtime they grew larger and larger, to the point that they became not only very expensive but also impossible to put on alone. The help of a slave was needed to drape them around the master’s body and over one arm. 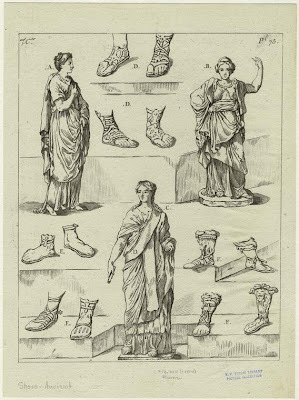 Not all togas were the same and they marked the social status and title of the wearer. The toga virilis, worn by adult men, was a simple off-white toga; magistrates wore the toga praetexta, which was an off-white toga edged with purple; the toga pulla was black and worn only in times of mourning; the toga candida was a bleached toga worn by aspiring politicians and whose whiteness represented the purity of their intentions; and the toga picta, which was purple and embroidered with gold, was worn by victorious generals and, later, by emperors. As mentioned above, women too wore a longer tunic. It was called stola and could have long or short sleeves, or even be sleeveless. It was kept in place by two belts, one around the waist and the other under the breasts, to enhance the figure. Underneath, they usually wore a longer tunic, called tunica interior, while over them, a palla, a sort of cloak that reached the knee. It was quite large and could also be used by women to cover their heads while walking in the streets. Unlike men’s clothes, women’s garments came in lots of bright and vivid colours and were often embroidered. Women’s clothes were usually made from linen and wool like men’s, but also of silk, which was very expensive as it was imported all the way from China and so worn only by rich women to showcase their wealth. But what did people wear underneath their tunics and togas? The answer may surprise some of you, but they wore underwear. Both men and women wore a subligar, also called subligaculum, a type of underwear available in two forms: that of a pair of shorts, or that of a simple loincloth wrapped around the lower body. Women also wore a sort of bra. Called mamillare or strophium, it was shaped like a band and tied tightly around the body, either across or under the bust (in the latter case it was usually worn over clothing). Its purpose was to support the breasts and push them up. Even a two-piece costume, which resembles the modern bikini, was worn by Ancient Roman girls to exercise or bathe in pools. 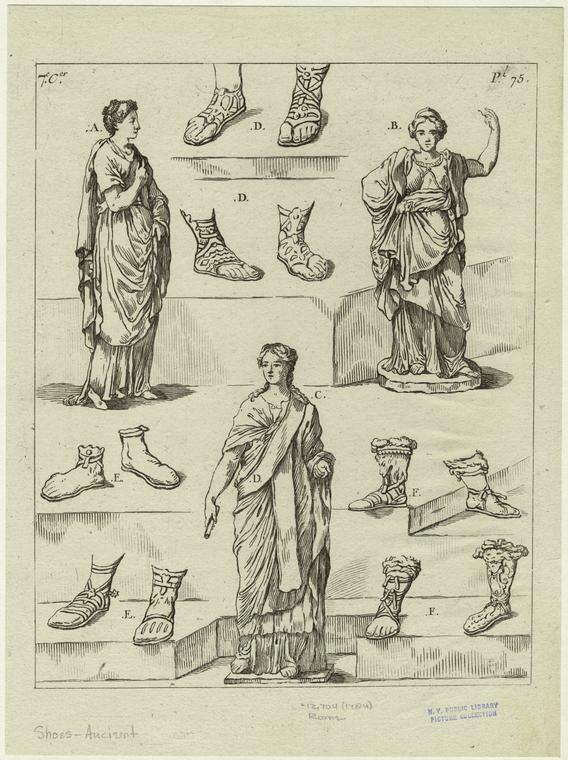 The Ancient Romans wore different types of shoes. In the streets, the Romans wore calcei, which were a sort of cross between a sandal and a shoe made of soft leather. Indoors, they would change and wear sandals instead. They were made by fixing strips of leather to a tough leather or cork base. Usually, when the Romans visited a friend at their house or attended a banquet, they would carry a pair of sandals with them which they would put on once reached their destination. Another type of indoor footwear was socci, which were basically a pair of slippers. Shoes could also mark rank and status: the shoes worn by consuls were white; patrician’s red and had an ornament at the back; senators’ were brown with black straps. Soldiers wore caligae, black boots whose sole was very thick and studded with hobnails. Women instead wore sandals or closed shoes that resembled small boots. The poorer classes and slaves only wore wooden clogs called sculponea.